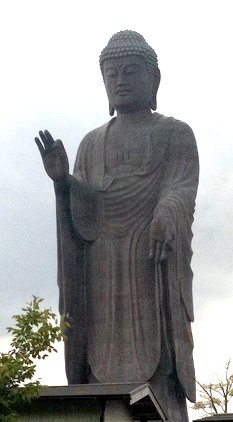 The Largest Statue in Japan and Third Largest in the World, the Ushiku Daibutsu. This last week was a holiday week in Japan. I took some time to go on a little road trip. We went up north about 80 kilometers to the area of Ushiku in the Ibaraki Prefecture. Ibaraki was a prefecture hit quite hard by the record breaking earthquake on March 11th. However, we were surprised, as we drove along, that we didn`t see much damage. Our initial destination was a shopping outlet, but as we got closer something caught our attention. A big something! A towering figure standing in the middle of nowhere suddenly appeared as we emerged from the winding road. I have never seen a statue so large. 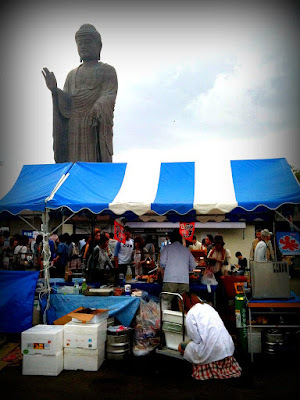 Taken from the outer court yard under a cloudy sky, the Daibutsu looking as a gigantic shadowy figure. Simply an amazing human construction! The statue itself is an amazing feat. It is enormous but extremely detailed. From folds in the robe to indentations on the face and hands, the craftmanship is impressive to say the least. This statue stands over 200 feet taller than the Statue of Liberty and almost 300 feet taller than the Christ Statue in Rio De Janeiro. Now it is not a coincidence that this giant Buddha statue and the shopping outlet are close to one another. Tourism is a vital part of local economies in Japan. This landmark is helping sustain the local population by providing jobs and attracting many tourists. You might even say that the statue was built not so much for religious reasons but more for economic reasons. Certainly the statue represents Buddhism and its philosophical ideals and teachings, but it also clearly demonstrates the commercialization of Japanese religion. I`m sure true believers may have mixed feelings about such a thing. The Ushiku Daibutsu overlooking the crowded market area in the outer courtyard. Visitors squeeze through crowds passing through souvenir and relic shops. These people have sat down to have a consultation about buying an expensive Buddhist statue or jewelry with supposed healing properties at one of the shops. Nonetheless, this is sort of thing is very Japanese. All over Japan you will see tourist sites based in Shinto or Buddhist art or architecture, but flooded with vendors, shops, and souvenirs all meant to provide income for those who live around the area and for the sponsors and curators of such elaborate projects. 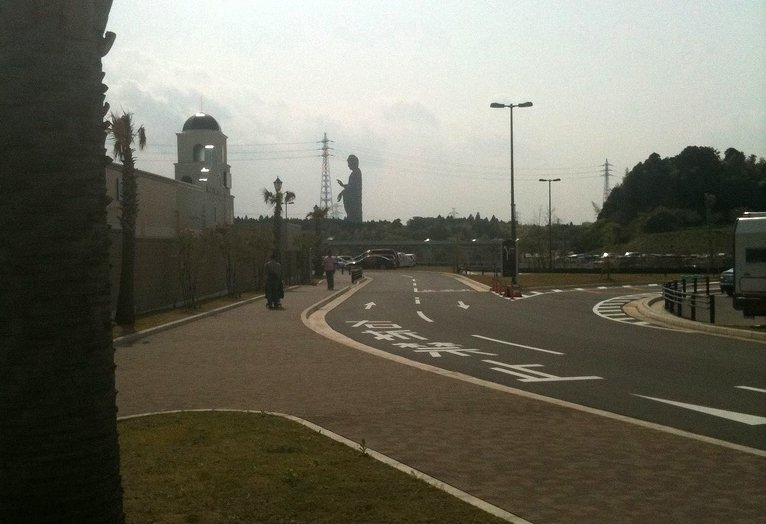 The statue does seem so out of place in those surroundings. I wonder what the Buddha would've thought of it.